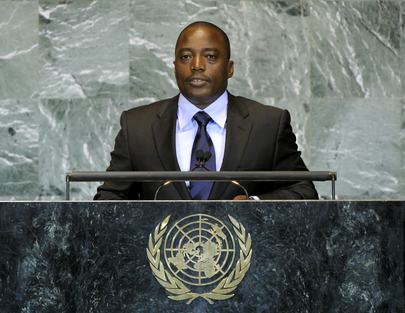 JOSEPH KABILA KABANGE, President of the Democratic Republic of Congo, said now was a key period for his country, breaking a spiral of violence and instability that had characterized it over recent decades, committing its people to a lasting democratic culture. Despite the challenges of the electoral process, everything was being done to hold transparent elections in a climate of calm. Peace and security in his country had been recovered, and now the role of the United Nations Organization Mission in the Democratic Republic of the Congo (MONUC) should be adapted beyond the strict format of peacekeeping to assist in the efforts of an economic re-launch. Many challenges remained, he said, but his country was determined to meet them. The military, police, judiciary and penitentiary systems needed reform to further ensure the security of the citizens and to stabilize the country. An organized return of displaced people and refugees was also needed, as well as the demobilization of child soldiers, effective control of natural resources and consolidation of good relations with neighbouring countries. After many years of conflict, countries in the region had concluded that war exacerbated problems more than solved them. He hailed South Sudan’s new membership in the United Nations, conveying to its citizens his fervent desires for their peace, happiness and prosperity. He said the Organization had responded to several challenges, justifying its creation at the end of the Second World War, but it needed to adapt to current realities, maintain efficacy and bolster confidence among Member States. To do that, it must revitalize the General Assembly, reform the Security Council and strengthen the role of the Economic and Social Council. That required a spirit of compromise and solidarity in the interest of all countries. The Organization must also properly address the fight against impunity and human rights violations. The Israeli-Palestinian question was another major concern for the Organization, which needed to find a legitimate solution, bearing in mind the interests and security of both parties for a fair and lasting settlement, he said. He also called for increased cooperation with the African Union in conflict management, in order to reduce hot spots in the continent. “I have focused my remarks today on the need to strengthen peace. This is the essential pre-condition for all progress,” he said. But, the United Nations still had enormous work to do in other areas by committing sincerely to renewing and strengthening the multilateral system.